Roham Sheikhani, Nikola Printz, Laura Bohn, and Duncan Wold perform an OBERIU play within the opera UKSUS. Costumes by Laura Hazlett. 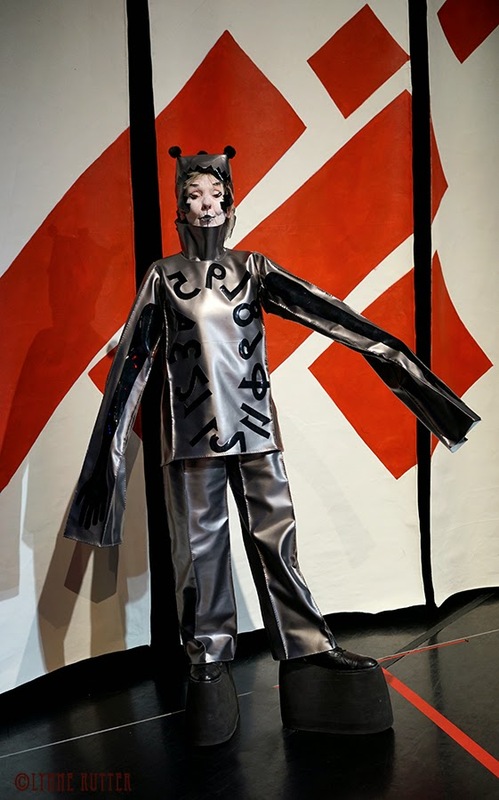 A few weeks ago Erling Wold's Fabrications staged the U.S. premiere of UKSUS, a surreal comic chamber opera based on the life and work of Russian absurdist writer Daniil Kharms. 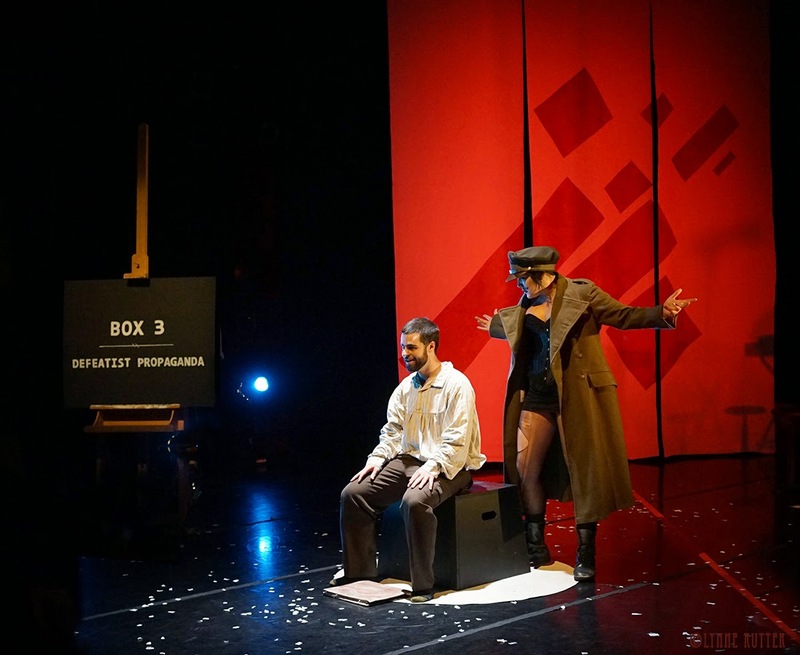 UKSUS was originally commissioned by the Klagenfurter Ensemble in Austria, and the libretto was written by Felix Strasser and Yulia Izmaylova, who also there directed it in December of 2012. 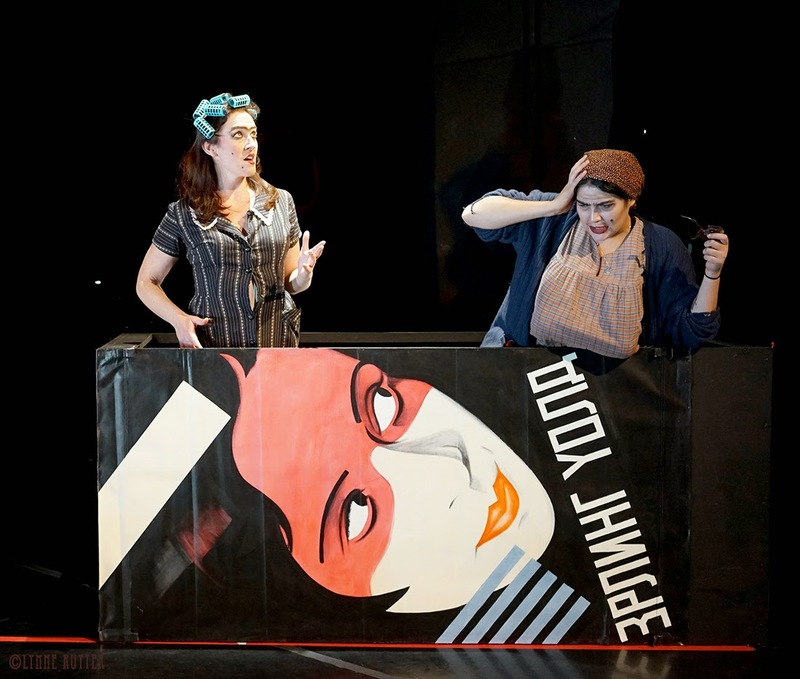 I attended several performances of that production and really enjoyed myself, in part because I don’t speak German and had no idea what was going on and could therefore approach it with a totally open mind; I felt like a kid watching a Punch and Judy show. 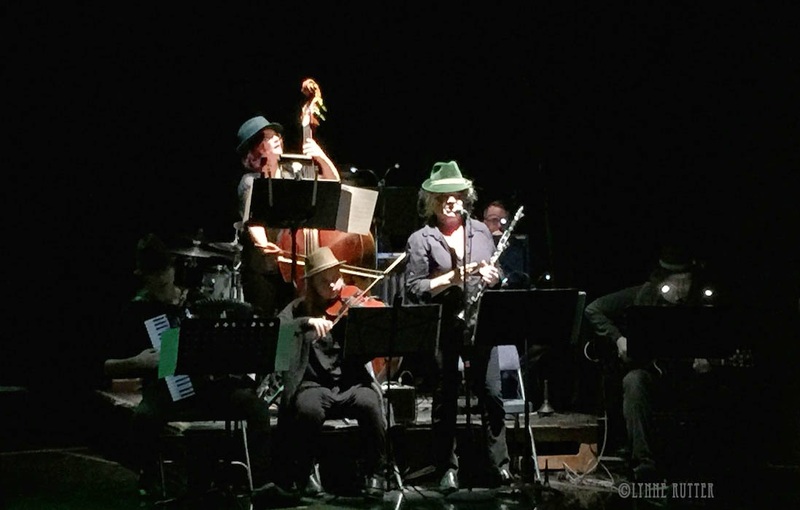 I loved the music, the energy of the band, the bizarreness, the smoke-filled bar in the smoke-filled lobby of the theater, the paintings of the trumpet player Richie Klammer, the snow outside, the embarrassingly long applause of the Austrian audiences. Everyone fell in love with Erling and everyone wanted to do the show again and again and everyone wanted to come to San Francisco to do it again. For the U.S. debut of UKSUS, it became obvious as time passed, that bringing over the Austrian cast was unfeasible. A new and local cast was assembled with Jim Cave directing. Jim is not afraid of nonsense, wackiness, surreal or absurd anything. He and Erling have worked together so many times they nearly finish each others sentences. I was asked nicely to be involved with the scenic design, and was even offered a budget. But when Jim started talking about the lunatics putting on a play in the asylum my eyes rolled into the back of my head and stayed there until he changed the subject, and so began our collaboration. Erling asked for three backdrops. The guys went and rented a theater that required the set to be struck every night to make room for the next day's classes, necessitating a lot of portable bits rather than something grand and unwieldy. I meant to write a post just about this scenic work: about the process of addressing the problems of the giant black space of Dance Mission Theater, the inspiration for the design, the tight budget and even tighter deadline; leaving out the parts about the emotional turmoil I felt working on this project at a time when I was already insanely busy and already suffering from the all-too-familiar torture that is the lot of the long-suffering wife of a too-charming pathological liar. Does anyone actually care that our lives were imploding while this all took place? Of course not. After all, the show must go on. UKSUS had only three performances in March, 2015. 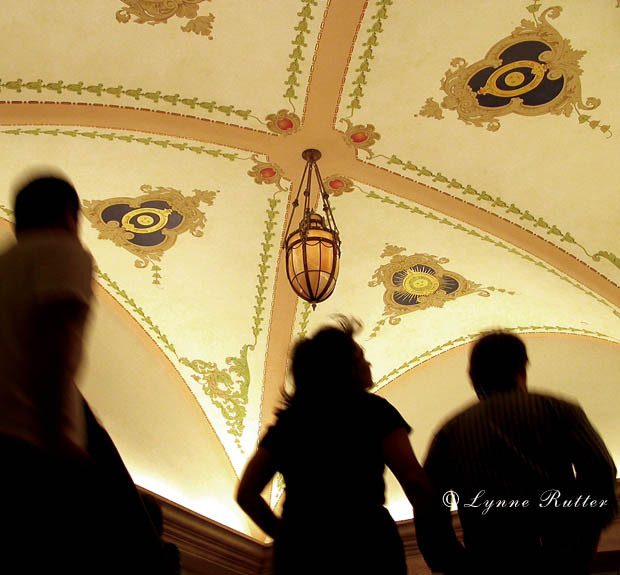 Despite full houses every night, lusty applause and effusive praise from the audience, especially from the younger attendees, some reviewers showed up with their cranky "Opera" pants on and just didn’t get it. This piece didn't really get the attention it deserved, and so I feel compelled to speak up and publish these awesome photos I took. Beth Custer is so damn cool. Let's start with the Music. Erling Wold's music is wonderful, transporting, by turns fun, tragic, solemn, uplifting. The orchestra gathered up like a great jazz band, rocked during the rock parts and danced through complex rhythms and delicate poignant passages thanks to our amazing conductor, Bryan Nies, whose skill is all sorts of amazing to watch as well as hear, as if everyone on the stage and in the band are strings of a single instrument, which he plays effortlessly. The story is ridiculous. There is no comprehensible narrative and there is no point. There is absurdity, nonsense, observations of everyday or imagined moments. Pushkin makes love to his wife, an old woman falls from a window, children are given tetanus to shut them up, the OBERIU put on a play in arty clown suits, the artist dies during one of Stalin's purges and his widow goes to Venzuela. These scenes are arranged in boxes; we even made hand-lettered placards to tell you which box was being opened. 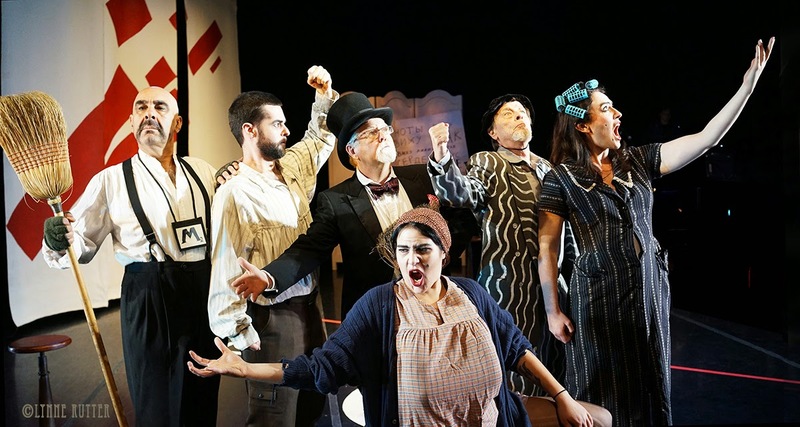 Erling added a somewhat pleonastic narration to the libretto, packed with context and commentary, which Jim delivered in his role as "a samovar," but he might not have bothered: absurdity and confusion make a nice team. The cast was a fantastic mix of singers and actors, mimes and clowns. Duncan Wold, one of the writers/comedians of San Francisco’s Mission CTRL comedy troupe, starred as the poet Pushkin, who is playing the role of Kharms himself. He approached this part as a comic actor, creating a deadpan character which added depth and contrast to his role, and it should be said that his comic timing was pitch-perfect, recalling the straight delivery a young Johnny Carson. Our favorite soprano Laura Bohn, with her soaring, beautiful voice, in this production got a chance to show off her physical theater skills, clowning, and dramatic unibrow. Her scenes with Duncan were both hysterical and endearing. Mezzo-soprano Nikola Printz gave a hilarious performance as both Our Mama and a gender-bending Stalin (both mustached parts) all the while thrilling us with her rich and resonant voice, especially thrilling when paired with Laura Bohn’s during certain goosebump-producing moments. Both our soprani are magnificent clowns, and it's refreshing to watch such versatile performers who can become their characters, without being overly concerned with how 'pretty' they look or sound. Bob Ernst, an actor with a face and voice so compelling he could read the label of cereal box and make you believe it the Magna Carta, declares that you must drink vinegar (uksus), and you pretty well want to do it. Speaking of amazing faces, it’s widely known that I have a crush on Roham Sheikhani, an actor and brilliant mime who in this show added an element of sanity as well as paranoia when needed. A deus ex machina appearance by Mary Forcade as the Karabister very nearly stole the show. 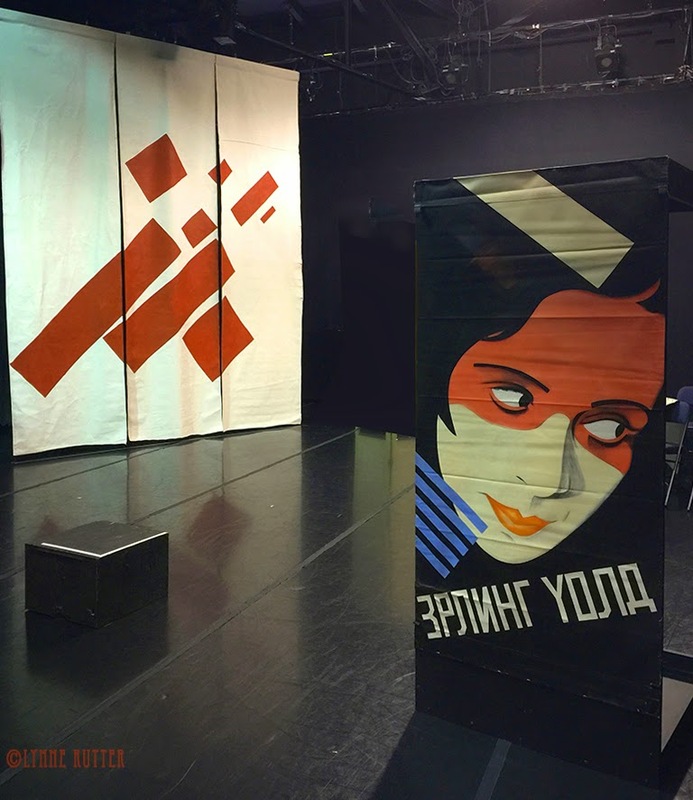 The sets were designed to emphasize the diagonal lines and bright palette of the Russian Avant Garde painters. I looked to Kharms’ close friend Kazimir Malevich, and the Constructivist movement, and to the splendid film posters designed by Russian graphic artists in the 1920s and 30’s. Costume designer Laura Hazlett brought this concept home with her supremely colorful pieces for the OBERIU performance within the show. Closing night we danced deliriously in the side aisle while the audience laughed and sighed, and afterwards everyone wanted to do UKSUS again and asked when can we? After the party and the vodka, we dragged the sets and costumes back to the garage where are stored the costumes and bits from the last opera and the one before that. More UKSUS-related rants at Erling Wold's blog. I love the scenic work! Working with a tight budget and mobility issues, you distilled the concepts into bold, clean graphics (as poster work has to do). Sorry the "opera pants" mentality killed the run. Pathological liar? Whoa, back up. Did I miss something in a previous post? 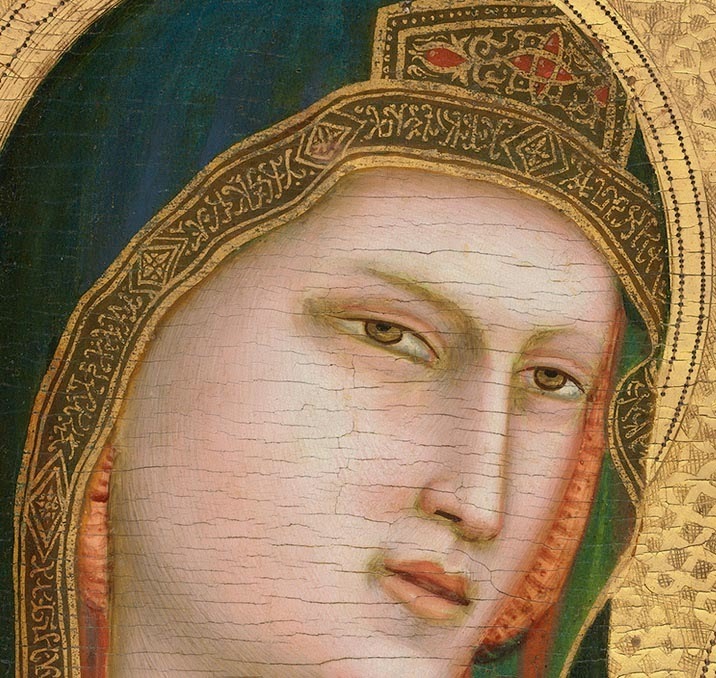 Regardless the painted work, the whole visual aspect of the production is really thrilling. Coincidentally I just watched a video on Zahad Hadid talking about her Malevich obsession. thanks for that video Scott! as for the liar, well yes we're all broken hearts here, thanks for your concern. We knew this going in, but it doesn't make it any easier, and we're working on it.